Coconut flour is very different than regular flour. It's gluten free and a great source of fiber. When you bake with it, you need so much less because it absorbs moisture like a sponge (you'll see in my recipe). It's going to be a regular part of my baking pantry from now on. I have some great ideas for things to make with it in the future! Chocolate Chip Macadamia Muffins. Okay, making something chocolate was my husband's idea (thanks, sweetie! ), but I did come up with the recipe! They're so yummy...perfect for a snack, or served with a scoop of vanilla ice cream and a drizzle of chocolate syrup (our favorite way to eat them)! Enjoy, and be sure to check out ALL of the great products at Tropical Traditions, like their Gold Label Virgin Coconut Oil. Tropical Traditions is America's source for coconut oil. Preheat oven to 350°F. Grease a muffin pan, or line with muffin papers. In a medium bowl, sift together coconut flour, baking powder, baking soda and salt. Set aside. Measure cocoa powder into a small bowl. Melt butter in a microwave safe dish. Drizzle and whisk melted butter into the cocoa powder. Set aside. In a stand mixer or a large bowl, beat the eggs with the brown sugar. Add the vanilla extract and the cocoa powder/butter mixture. Now, mix in the flour mixture and then let the mixture sit for 5 minutes to thicken a bit. Fold in the chocolate chips and macadamias. Fill muffin pan. Bake for about 25 minutes, depending on your oven. When a cake tester comes out clean, they're done. 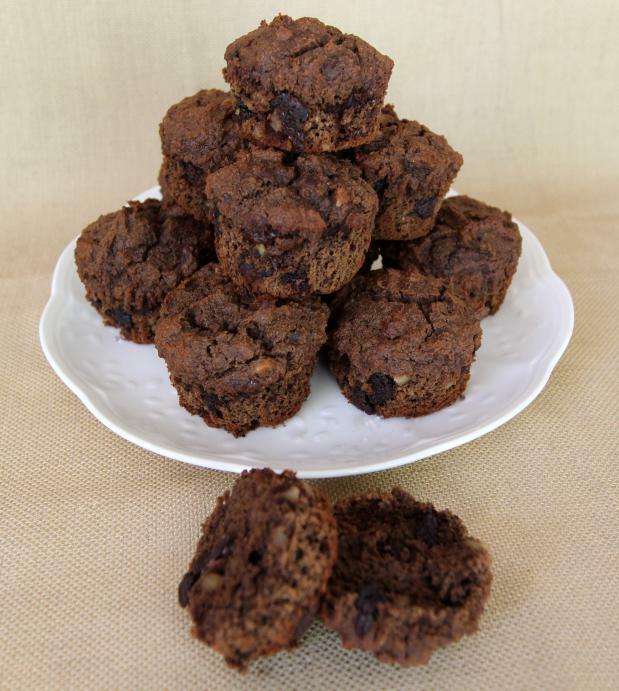 Transfer muffins to a cooling rack, but make sure you eat a warm one...mmmmm, melty chocolate chips! Enjoy!